pArts: David Gordon Green's "Joe" - Cage is the man. Undertow, All the Real Girls, and now Joe . . . David Gordon Green again proves himself to be among the greatest indie film directors/producers in the business. 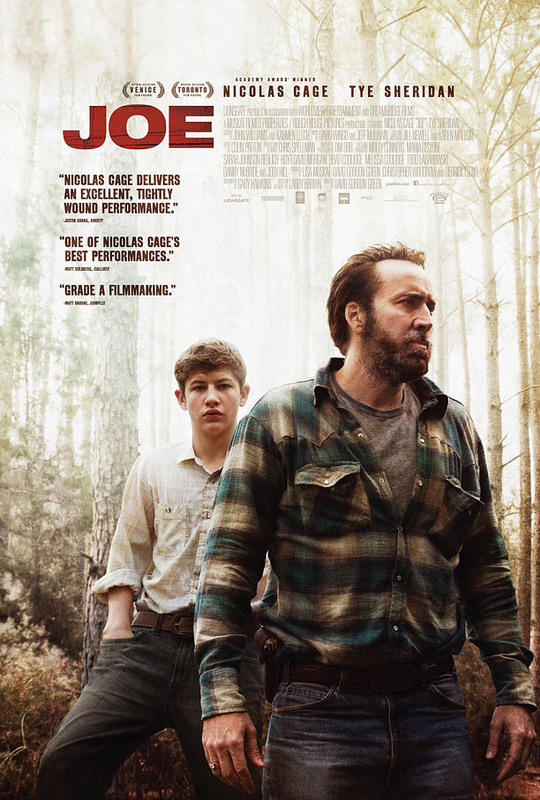 In Joe, Green gives Nicolas Cage one of the strongest roles of his career. In fact, I can't think of a better performance from this actor than what he brings to the title character of this remarkable film. The greatest directors all have a sense of personal style that is immediately identifiable and, as unlikely as it seems, I went into Joe not knowing a thing about it (other than the brief 2 sentence synopsis) but immediately sensed this was the work of DGG. An ex-con with a propensity towards violence frequently kept at the simmering point (barely), Joe is, nonetheless, a solid man, a good hearted fellow with a moral conscience that at time seems to torture him and barely keeps him from returning to prison. Leading and managing a group of black, aging forest day workers,he takes in 15 year old, badly abused Gary as a hand. Up until know the only hand this kid has known has been that of Wade, his raging alcoholic of a father whose abuse on his family is the stuff of nightmares. Unlike most mentor flicks, Joe reveals himself to Gary, warts and all, but even so, Joe is the halcyon lake to Wade's cesspool. As ever, Green plumbs the depths of each of his characters and they unfold before our eyes, exposing a humanity borne both of darkness and light. Even Wade, despite his despicability, becomes more of a tragic figure, more pitiable than loathsome (though loathsome is not out of the question). In addition to the central redemption story, Joe shows the title character's interactions among his poor, rural Texas community with Green skimping neither on the brutality nor the horrors of this life bringing an unflinching realism that comes off in near documentary style. Throughout the darkness Joe is shot through with moments of almost comedic lightness that lend a believable truth to the film, something missing from many bigger budgeted Hollywood movies. As an example and, without revealing too much, a potentially dangerous scene segues into a break dancing lesson from the most unlikely of characters, a moment of cinematic magic that didn't cost a million dollars. As with most of this director's films, the cast could not be bettered. 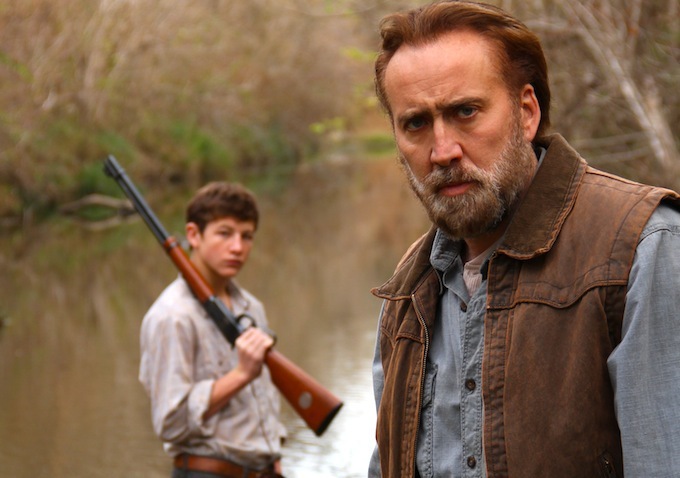 In addition to Cage's already lauded turn as Joe, Tye Sheridan's performance as Gary is a thing of beauty, capturing one who has seen too much too soon yet still hopes to retain a thread of the innocence every kid deserves. It's masterful work from a gifted young actor. 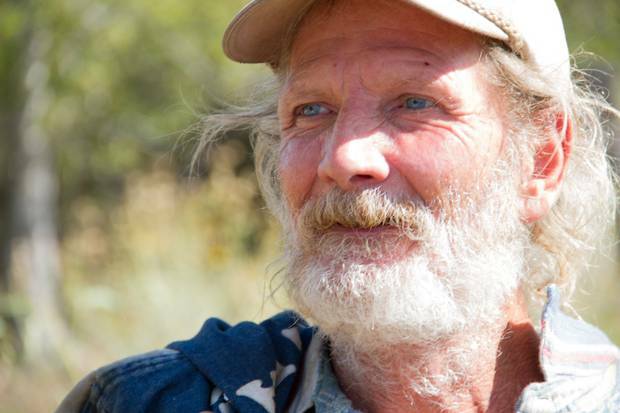 As Wade, Green cast a local homeless man, Gary Poulter, who pulls in whatever it was in his life that took him there . . . and gives it back to us tenfold. It is a terrifying, soul searing and tortured performance. (Note: Mr. Poulter died two months after filming and is one of two people Joe is dedicated to). Ronnie Gene Blevins, Adriene Mishler, Elbert Hill, A.J. Wilson McPhaul and the rest of the cast all contribute mightily to the telling of this tale, written by Gary Hawkins based upon Larry Brown's novel of the same name. Cinematography and soundtrack are wed exquisitely, with at least one incredible sequence featuring noise (feedback, electronics, etc.) in place of music to chilling effect. While Joe is not a film for the faint of heart, those willing enter to its world on its own terms are in for a richly rewarding film experience with some powerful performances. I remember another movie titled Joe that starred Peter Boyle and Susan Sarandon in 1970. It made a big splash during the hippy/student revolt/civil rights era.